Slashing at the right time will help establish frost tolerant grasses. Take a walk over your property and assess it for things like discolouration (nutrient deficiencies), grass species and densities as well as weeds. If everything looks OK, and it has had a history of renovation there is a good chance that some of the desirable winter active perennial species still persist. A good slashing at this time of year can do wonders for re-establishment, particularly if you have a predominance of summer growing grasses that have gone to head and died off. They will continue to shade the emerging seedlings if not removed. 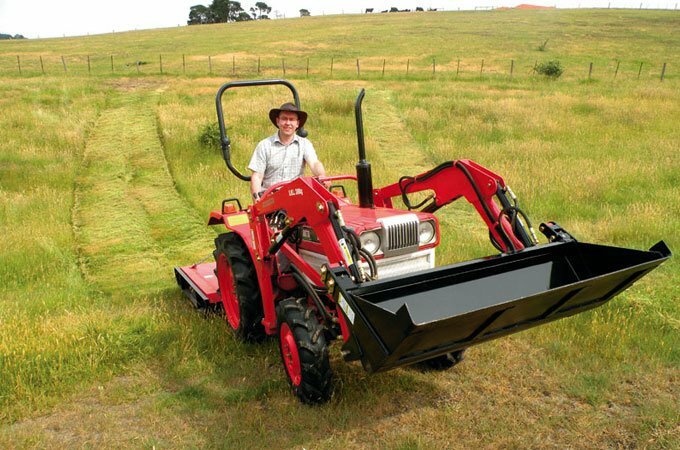 If the grass is particularly long and rank, it is a good idea to rake it up and remove it from the paddock after slashing, as it will continue to hinder establishing winter-active grasses as the windrows of slashed material rot down. ‘Winter-active grasses’ is actually a bit of a misnomer. They are really frost tolerant grasses that can survive and grow modestly through the cooler months where others do not. Their most prodigious output will be in spring, however they should be encouraged now to help get you through the winter feed gap. If they can establish vigorously in autumn while the soil is still warm, they will be ready to bolt as soon as spring arrives, out-competing weeds and less productive grasses that have been lurking idly by. Never fear, the old established summer grasses will return as the winter-actives peter out. Slash along fencelines in low gear first. When slashing, the accepted wisdom is to do the fenceline first. When negotiating fencelines it’s best to do it in low gear, looking out for fallen wire, branches and being wary of damaging it. Also keep an eye out for repairs. Now that the cooler days are here, you can get your teeth into some fencing as well. If you have fenced off tree lines or shelter belts, it is necessary to remove some of the bigger branches before slashing. A stick rake can be employed to good effect, however many people utilise indolent teenagers under the auspices of character building. 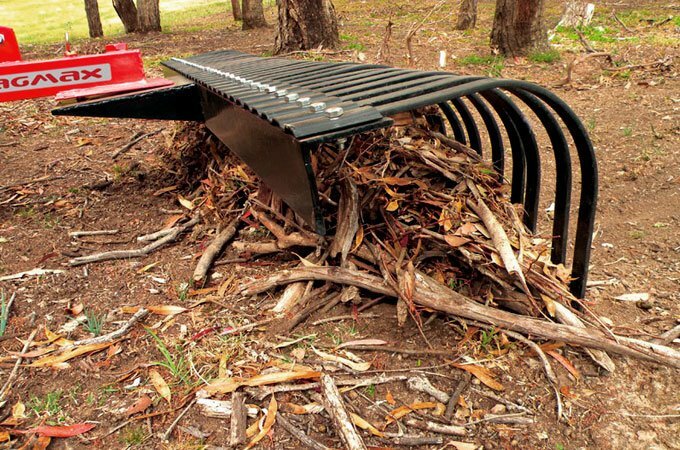 A Stick Rake can help remove bigger branches before slashing. 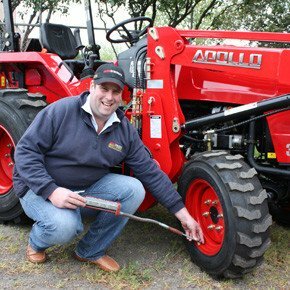 Another reason to proceed slowly around fences is because the momentum of a slasher can push the tractor forward – particularly when the clutch pedal is depressed at operating RPM. Remember, no matter how user friendly your tractor is, the best way to brake the slasher is by reducing using the engine RPM. Your tractor and slasher operate best at the recommended RPM/PTO speed; so keep it there. Reversing and changing gears and ranges is bothersome as well as causing unnecessary wear and tear. Do as much as you can in one forward gear. Over-revving the machine to increase speed is not desirable, but nor is under-revving, or labouring the tractor. If the grass is heavier in one area, simply take a narrower cut to maintain speed. 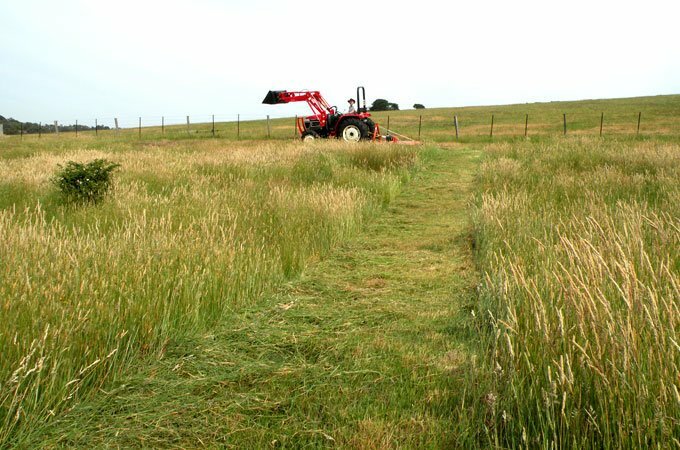 To make the job easier, always cut in the direction that expels to slashed grass (windrows) away from the next pass, cutting slowly in from the perimeter fence. If the shape of the paddock does not allow this, slash it in appropriate sections. As with all tractor jobs there is no need for haste. Operating the machine sensibly and safely takes priority. And, if any parts are missed, you can do them afterwards. Ron Krupa – Yalca, Victoria.